The Chosen believe that rainbows are a link between earth and sky. This is why the God Emperor and others of the House of the Masks have a rainbow strip as part of their heraldry. The Rainbow Stair connects the earth of the Labyrinth with the Halls of Thunder cut high into the Pillar of Heaven. These halls are believed to be in the sky. The three diagrams show three sections of the Rainbow Stair as it zig-zags 2000m up the face of the Pillar of Heaven. The lowest shows the steps as they rise from the ground. 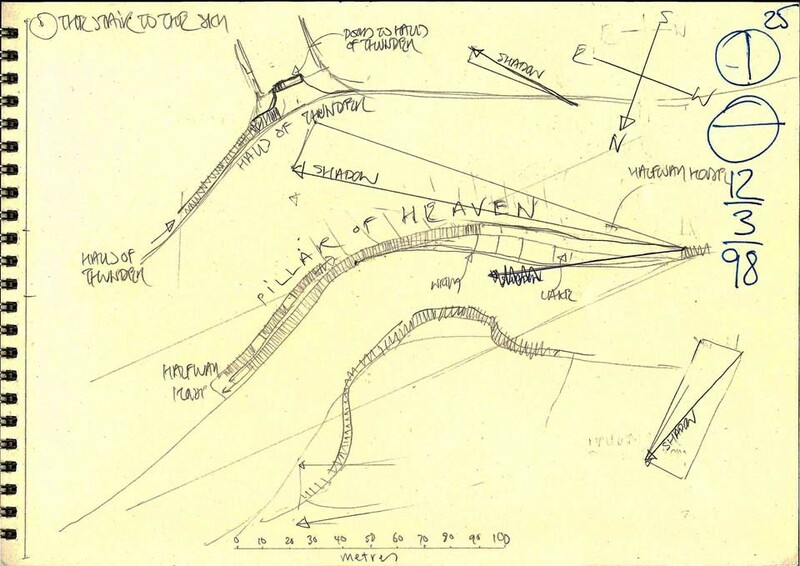 The middle diagram shows a portion of the Stair (in which a scene from The Chosen is enacted) which is bordered on its northern edge by a narrow lake and on its southern edge by wayhouses. These wayhouses are caverns cut into the rock which traffic going up and down the Stair can use as shelter for the night. The topmost diagram shows the termination of the Stair at the gates to the Halls of Thunder.